Last month, I came across a blog post on Stephen’s Lighthouse about a consensus cloud entitled “Books Everyone Should Read.” This post inspired us here at Midwest Tape to develop our own cloud. After scouring through critical review sources (like Publishers Weekly, Booklist, and Library Journal), award nominees and winners (such as The Audies, Parents Choice, and AudioFile Earphones), and lists from major publications (like The New York Times, O Magazine, US Weekly, and Entertainment Weekly), Midwest Tape noted and tallied the most frequently occurring titles. 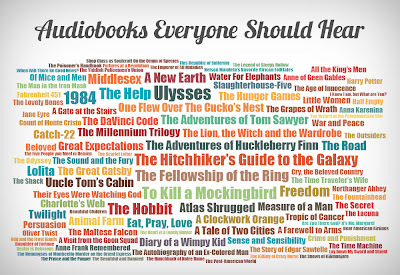 From this tallied list, we constructed our “Audiobooks Everyone Should Hear” cloud. These audiobooks have garnered the most critical praise, awards, and popularity over time. 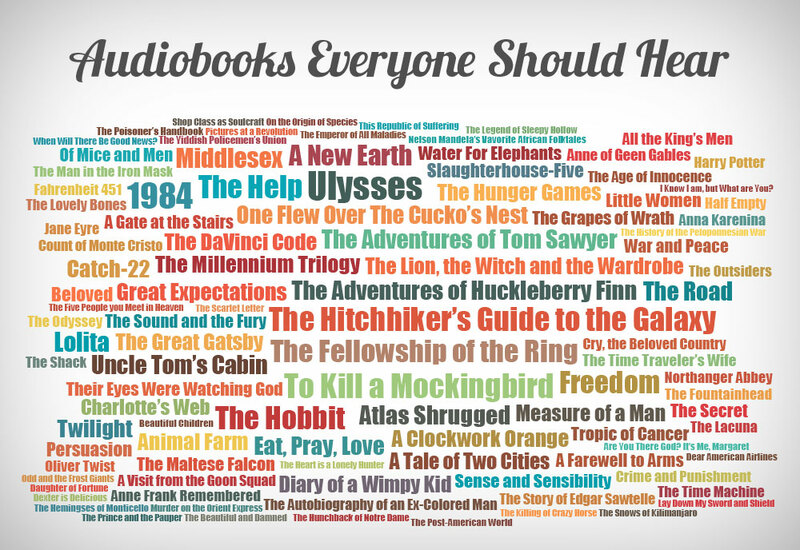 Do you see your library’s most popular audiobook? What audiobook do you recommend the most? Is it in our cloud? Is your library missing anything from our audio cloud? Shop this collection of classics and contemporary sensations now: search “Audiobooks Everyone Should Hear” in SmartBrowse. Jewel cases crack; their hinges snap; and their disc teeth break. It’s no wonder so many of our customers are signing up for case transfers, requesting their CDs arrive repackaged in more durable, drop-box-safe cases. But what do you do with all the broken Jewels you have back at your library? In honor of Earth Day, we decided to research and share with you how to recycle your Jewel cases. Unfortunately, recycling your Jewels isn’t as simple as tossing them in your city-issued big blue recycling receptacle. Jewel cases are made from brittle polystyrene—a type of plastic that takes a very long time to biodegrade. Because of its light weight and low scrap value, polystyrene is not easily recycled, thus most curbside collection programs do not accept it. Many people then turn to simply tossing their polystyrene—like Styrofoam, yogurt cups, and disposable razors—into the garbage, ultimately contributing to beach and ocean debris as well as incinerators and permanent landfills. Most recycling centers encourage people to reuse their Jewel cases if possible—like as a lamp, a birdhouse, or bookends. Has your library done an activity that involves reusing Jewel cases? If so, what creative things did your team and/or patrons make? They’ll recycle the damaged cases for you, and while you’ll have to pay for shipping, you’ll generate less trash, contribute less to landfills, and decrease the amount of incinerator emissions polluting our air. CD Recycling Center of America suggests your library make a campaign of it and encourage patrons to also donate any damaged cases. Note: CD Recycling Center of America also recycles damaged discs. You can box up your discs and mark the package “discs only” and ship it to the same above address. Once again, you pay for shipping, but CD Recycling Central notes that if you ship “media mail” you’ll pay less for postage. You can also toss any damaged discs you want recycled into your box as well. Discs and cases do not need separated. 3.) GreenDisk also offers Jewel case collection as well as a slew of other “technotrash” (like discs, ink cartridges, cell phones, videotapes, pagers, and PDAs). After packing up your damaged cases and weighing your box, you can purchase and print a shipping label through GreenDisk’s site. GreenDisk differs from the other two companies above in that a small fee is worked into the shipping amount you purchase. However, you are able to box up other “technotrash” in your case box and have GreenDisk take care of recycling all of it. 4.) Visit Earth911.com, and enter “#6 Plastic (Polystyrene)” and your library’s city or zip code to search for nearby drop-off recycling centers. You can then follow packaging and drop-off instructions provided by the listed nearby centers. We here at Midwest Tape are really big on recycling too. In 2010, we recycled 262,050 pounds of plastic DVD and CD cases. We work with a local plastic solution company that collects and recycles our Polystyrene for use in underground utility boxes. Now that we’ve reviewed ways to recycle Jewel cases, let’s get your insights. Know of any other ways to recycle damaged cases? What else does your library reuse or recycle? How are you celebrating Earth Day? We here at Midwest Tape are all a-buzz, and it isn’t just because spring is finally here. 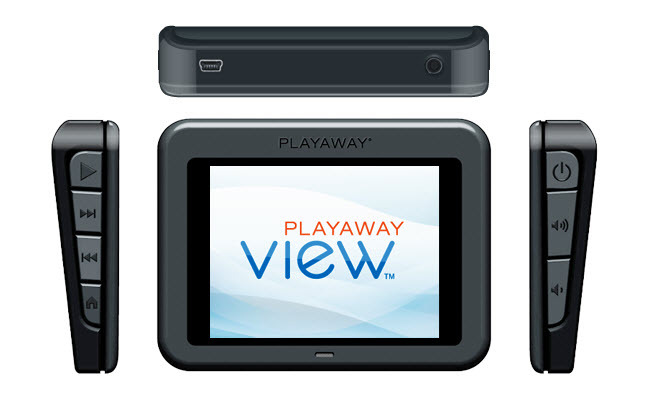 It’s the Playaway View—the first and only pre-loaded video player available exclusively to libraries! The Playaway View has a built-in speaker, so no ear buds are necessary. (It does have a headphone jack for patrons who’d prefer to listen to the device with their own ear buds.) The View also doesn’t require standard batteries. Featuring an internal lithium-polymer battery, the View provides over 8 hours of continuous play and can be charged with its included AC adapter. To enhance its shelf-readiness, the View comes in a One-Time™ Lock compatible package similar to Playaway Audio’s case. 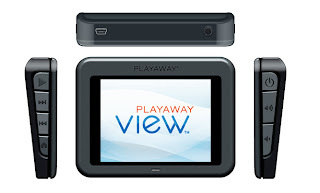 The Playaway View is not only portable, but also extremely durable. Specifically designed to withstand drops, the View weighs only 5.4 ounces and features a shatter-resistant acrylic screen cover, making it the perfect entertainment device for kids. Pre-loaded with multiple videos, the View will offer titles from such studios as Sesame Street, PBS Kids, TumbleBooks, National Geographic, Weston Woods, Spoken Arts, TMW Media Group, Schlessinger, 100% Educational Books, and Nickelodeon. Each player will feature three to seven titles bundled together. 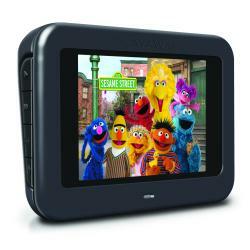 The View features a 3.5" full-color LCD screen for vibrant video viewing and has a simple 7 button functionality. Ensuring the quality of your product is easy too! 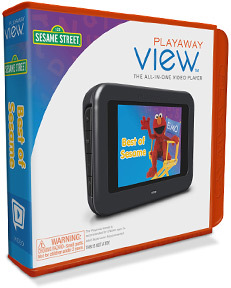 The Playaway View features the same one year warranty as Playaway Audio devices. The View will be available to Midwest Tape customers starting in May. Stay tuned to MidwestTapes.com to learn more about availability and ordering. Got View Qs? Post them here as comments or contact Customer Service at 800.875.2785.